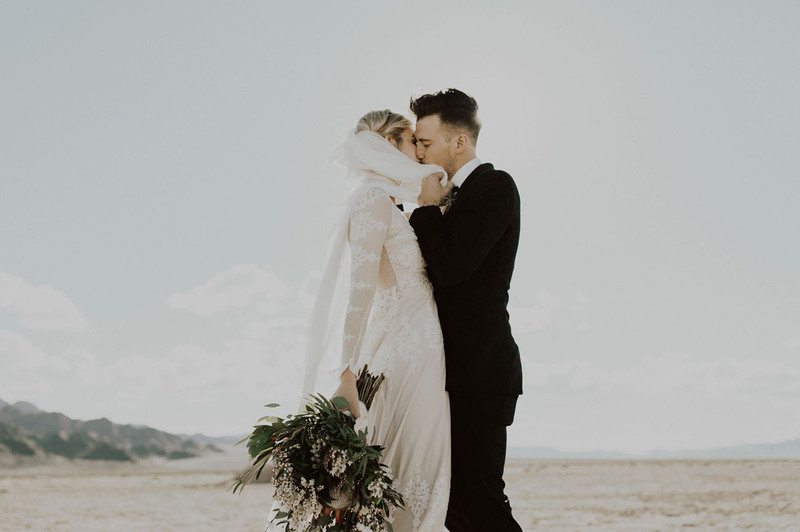 Have you ever considered having a pop-up wedding? 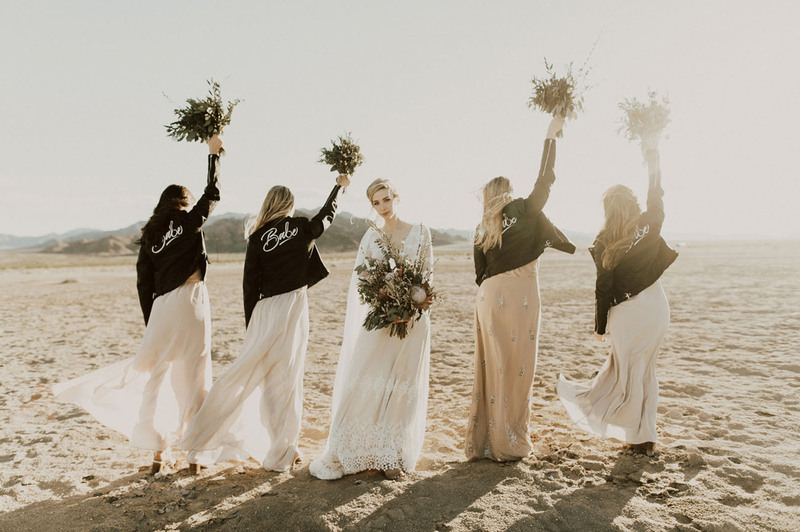 As in a wedding out in the wilderness, where you bring everything to set up a ceremony space, and make it completely your own? 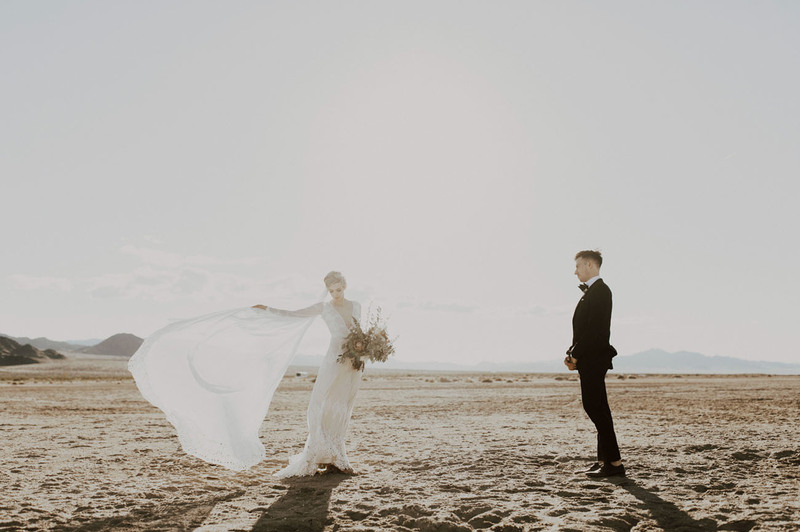 Well, today’s minimal desert wedding out on the Salt Flats in Palm Springs *might* just convince you. 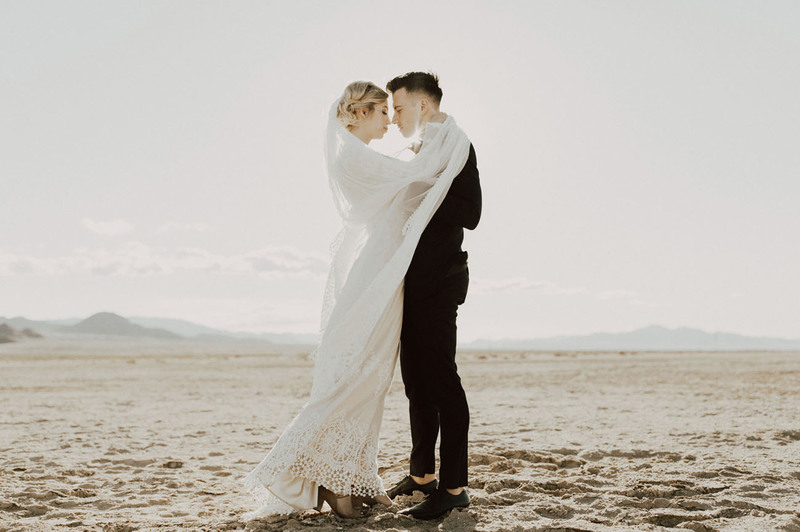 Jules (affectionally known as JuJu) by her darling, Mark, met on Tinder and decided to elope in the desert of California with just their closest friends + family. 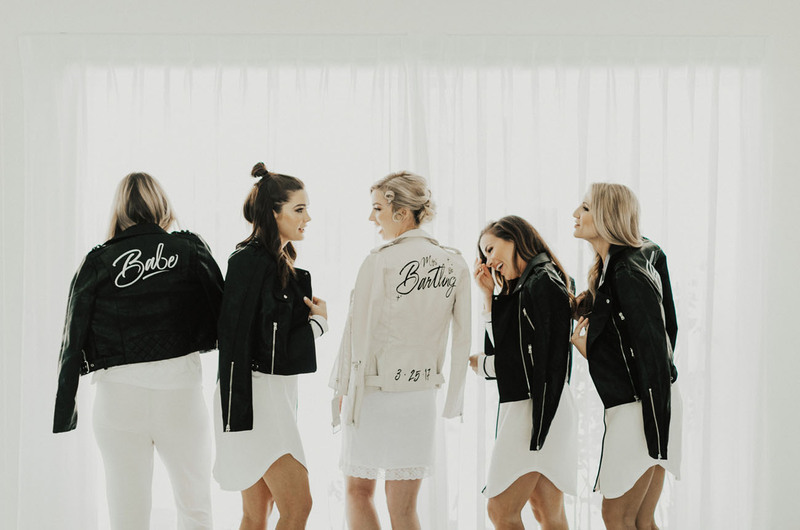 The two each got ready in an Airbnb, surrounded by their best friends… Jules gifted her gals, or “babes” super RAD leather jackets, which she screen printed herself (you’ll see them below!). 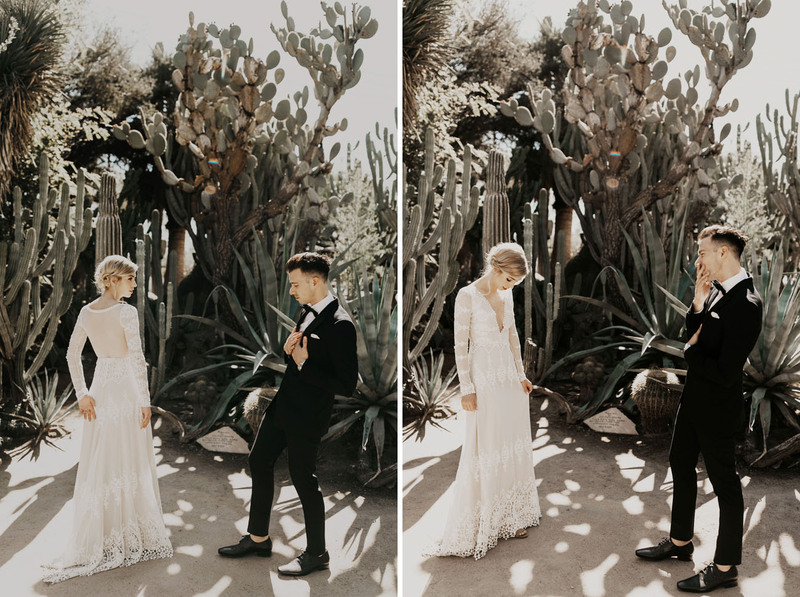 Following their first look in a cactus garden — captured perfectly by the ever-amazing India Earl, everyone loaded up on a party bus and took the 1 1/2 drive out to the California Salt Flats. 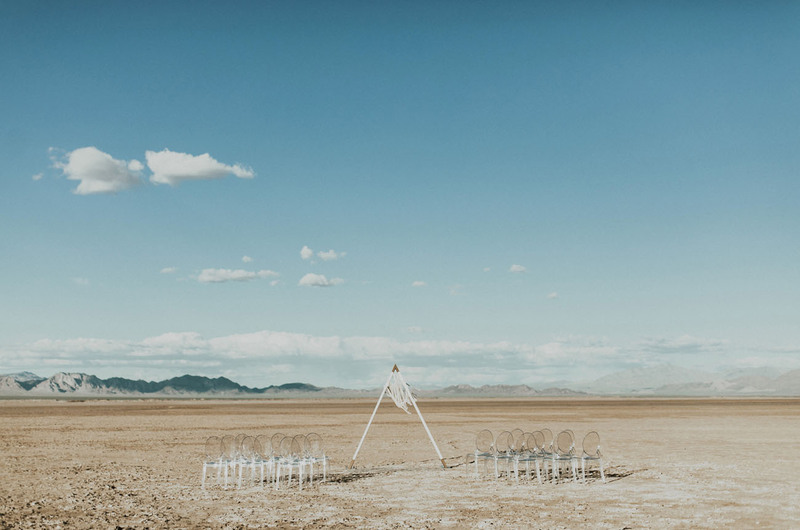 Once they arrived, the men unloaded the altar, chairs, and they set up the pop-up wedding! 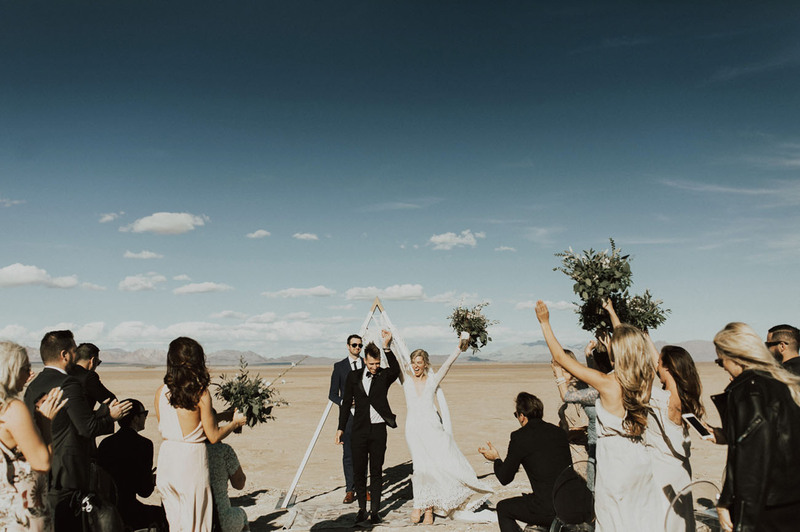 Jules shares Our inspiration was a minimal desert theme. We go out to Palm Springs often for quick getaways. It’s where we fell in love in the early stages of our relationship… A quick road trip while blasting music to a small oasis away from everything. 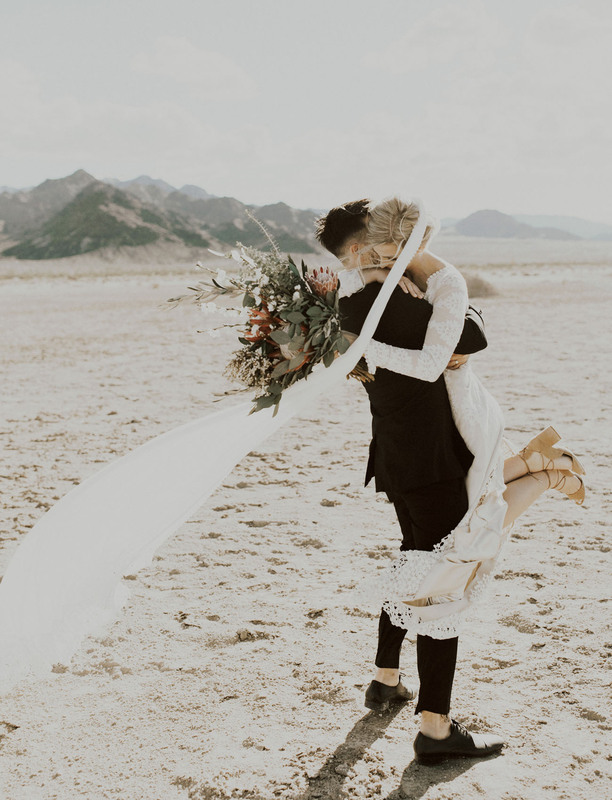 We fell in love with the modern bohemian vibe of the desert: the natural colors, the textures of sand, and the cacti surrounded by a mountain backdrop. 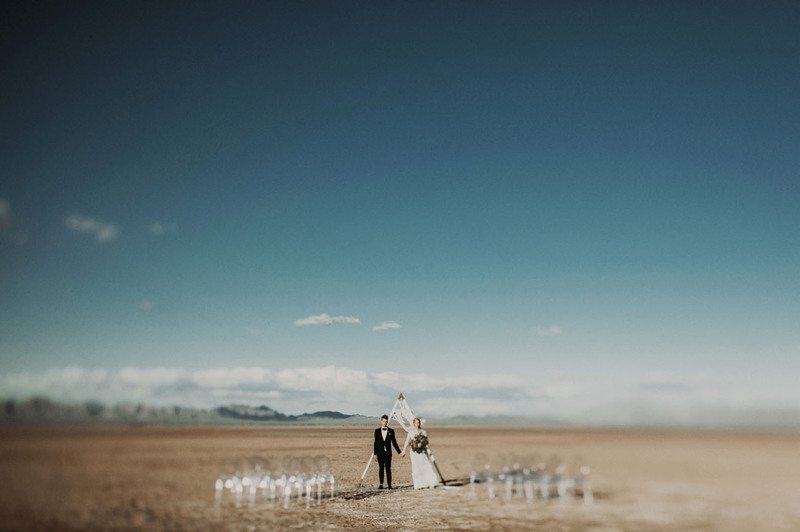 Ready to travel out to the Salt Flats? Let’s go!! 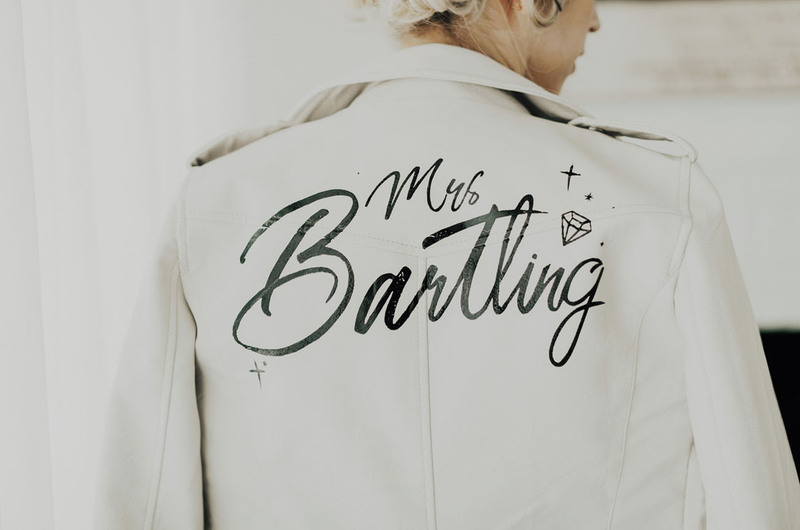 Calligraphy leather jackets are a recent fave of ours… How rad would these be for your whole squad? 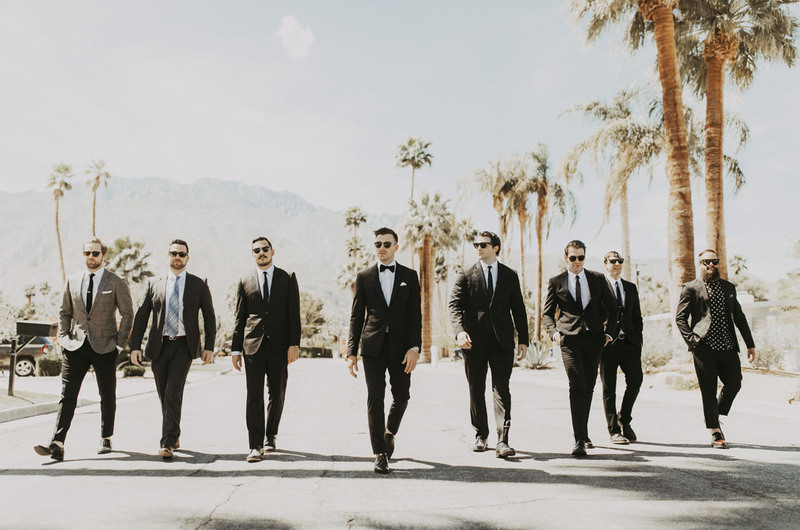 What a stylin’ group of groomsmen! 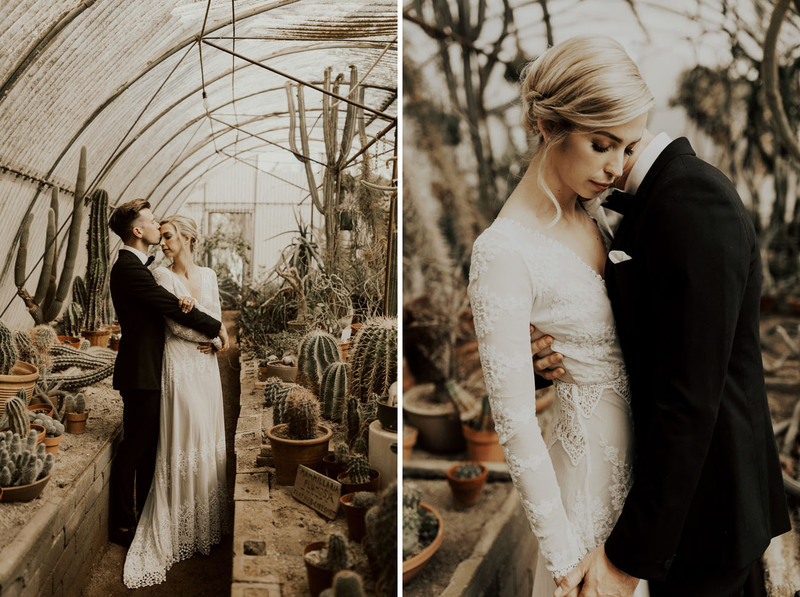 India shares They had their first look in a cactus garden, where they walked in a spiral around trees and cacti towards each other, rather than the traditional turnaround or tap on the shoulder, so it was a first look for the both of them. 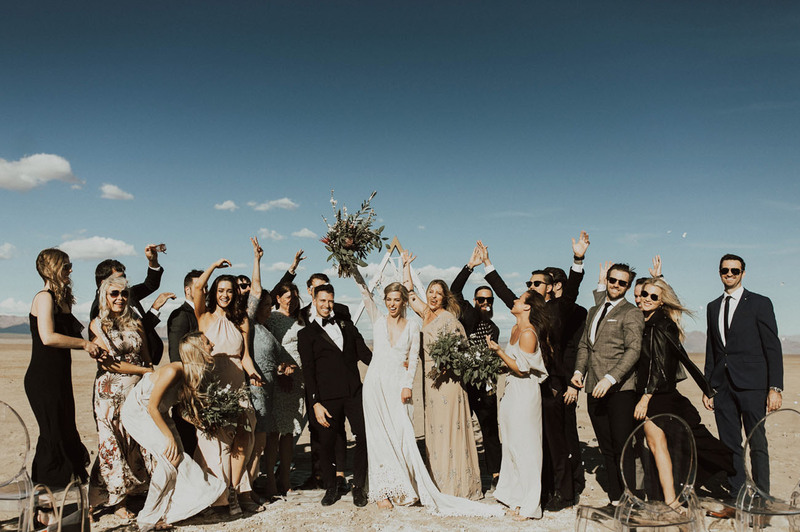 Jules: I think we both could agree that out of all the unforgettable moments we had on our day, there was one that stood out a little more than the rest. After a two hour bus ride, we finally pulled off to the side of the road at the Amboy Salt Flats. 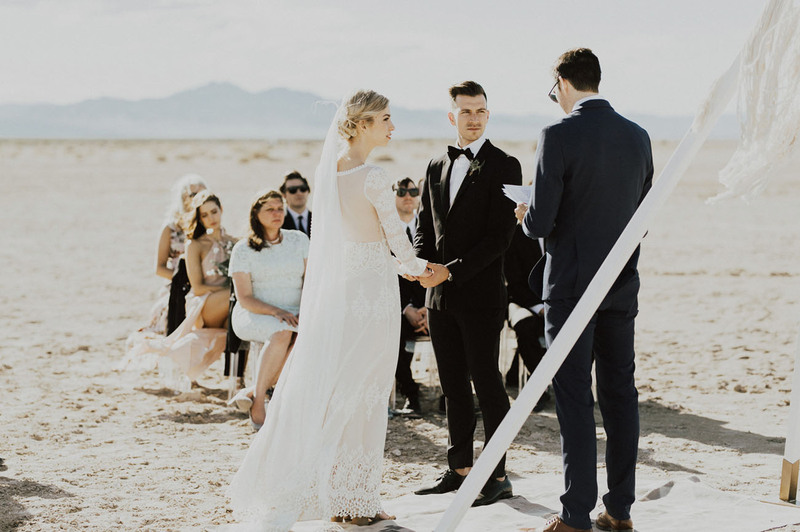 From then it became a fire-drill, where all the guys quickly got off the bus grabbing the altar, ghost chairs, rug and macrame for the ceremony. 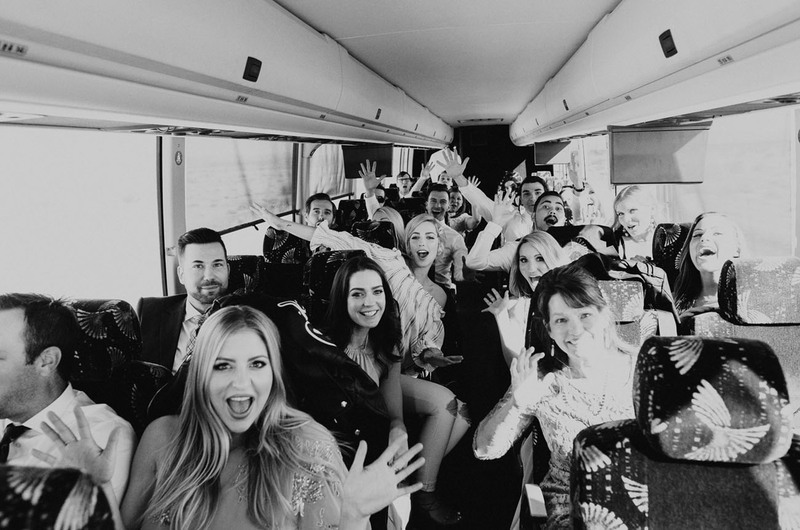 A "pinch me moment" was zipping up my wedding dress on the bus with the help from my mom and bridesmaids as I watched our dream wedding come to life and unfold before my eyes. In that moment I couldn't help get emotional from feeling the love and support from our amazing friends and family. 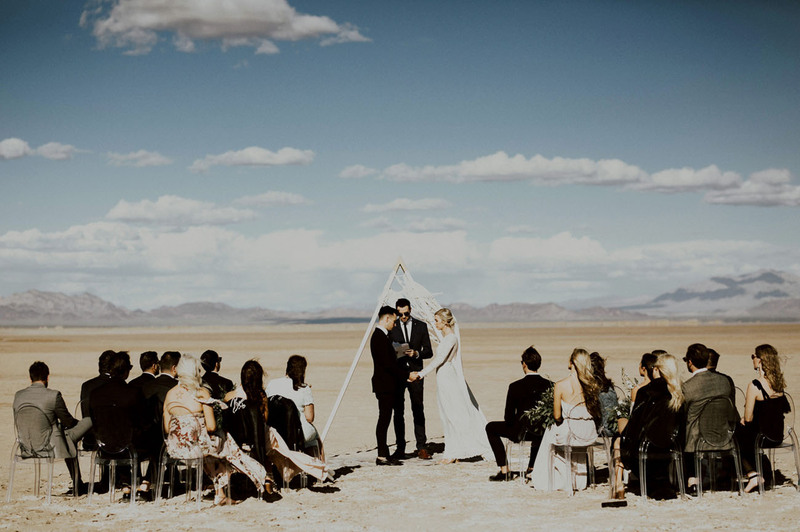 Mark: It truly was a surreal experience grabbing the altar from the bus and walking out into the desert with my two brothers and friends. Watching everyone come together to help set up our pop-up wedding was an out-of-body experience I will never forget. 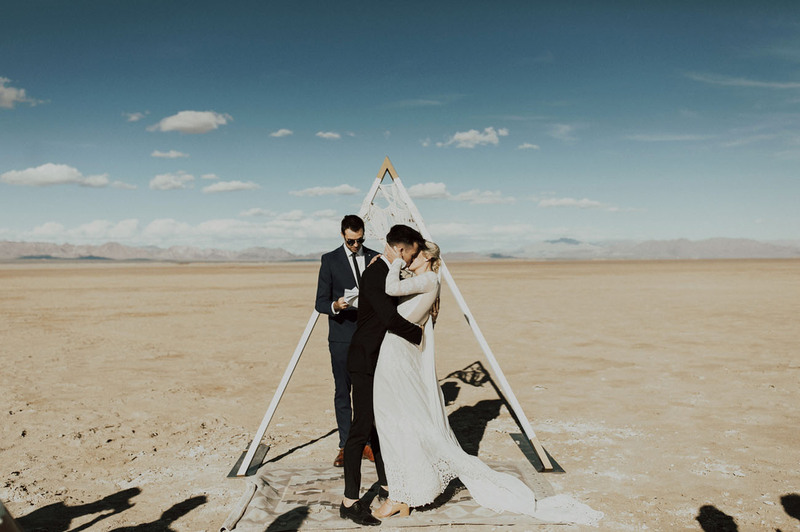 This ceremony was something we've planed and dreamed about for months, and to finally witness it all to come together before my eyes with the help from everyone we love was indescribable. We couldn't have done it without our friends and family helping us and we are so blessed to have such incredible relationships in our lives. 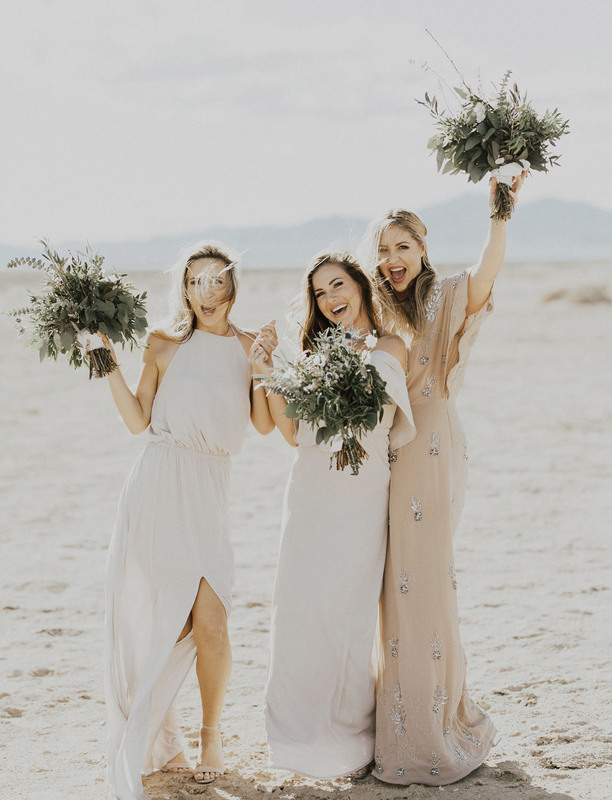 That ‘maids wore gowns in the color “Crisp” from Show Me Your Mumu, to perfectly blend into the natural setting. Don’t ever forget the feeling you both had the day of getting engaged. Where the two of you of you are on top of the world and soaring on cloud 9. 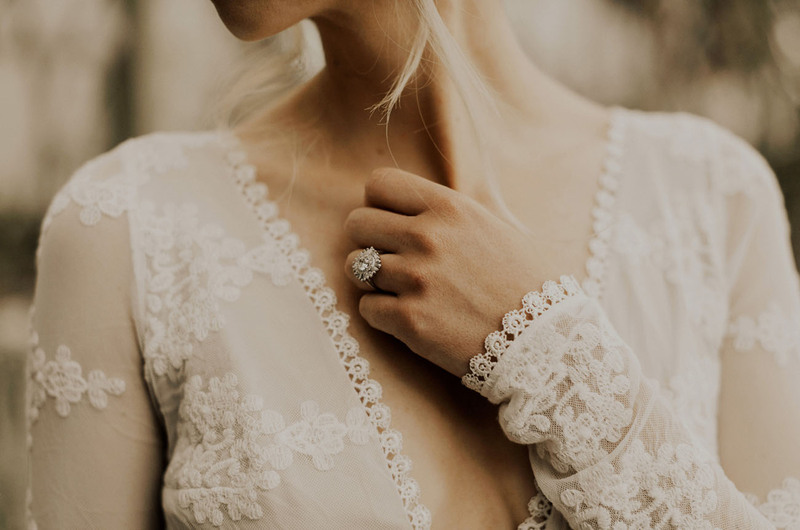 Because weddings can be so stressful, overwhelming and at times a burden. 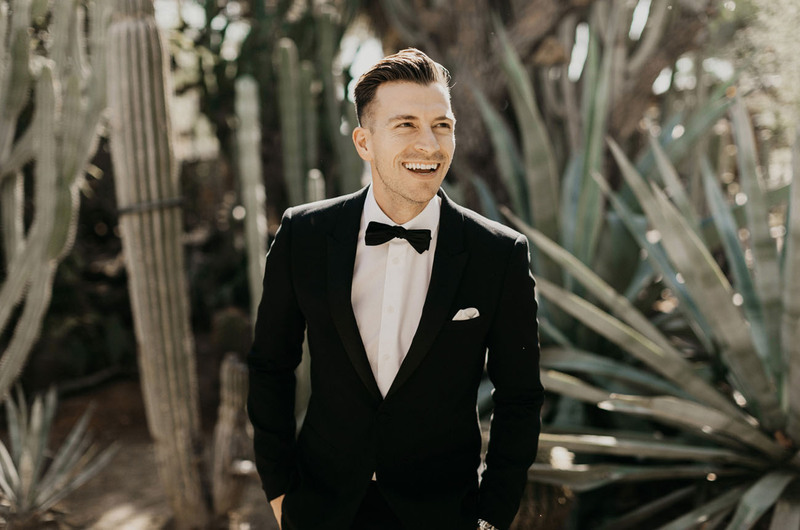 So if there’s ever a time you both can take a step back and really enjoy the process of planning your wedding, then you should do it! Because time flies and there’s beautiful moments in the journey to forever. 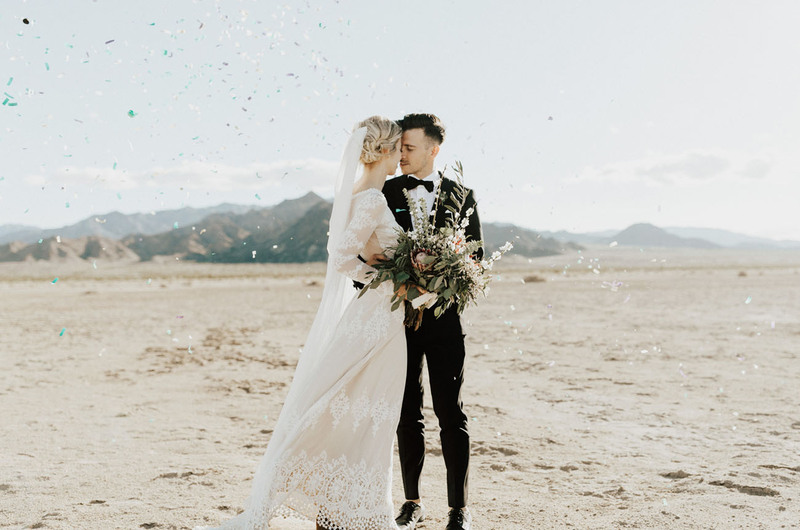 That veil + that dress from Dreamers and Lovers + all that crochet lace detail! 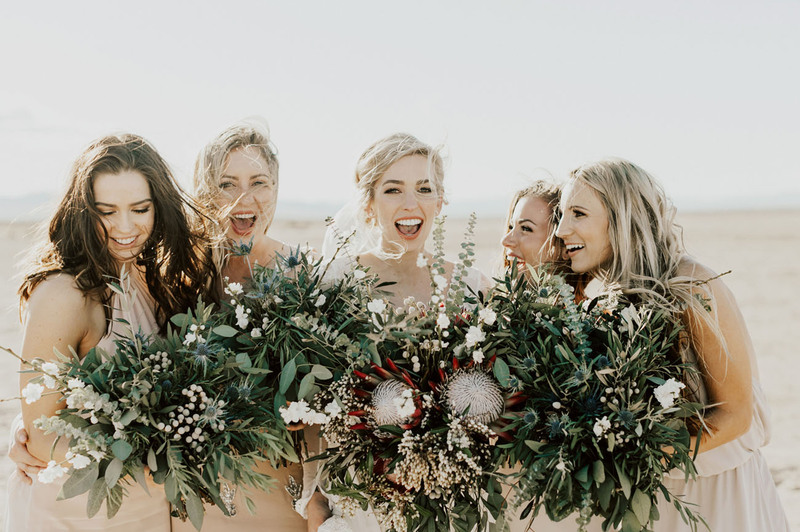 Eucalyptus with pops of white and two king proteas in the bride’s bouquet… These stunning florals were crafted by LeeLina Martin. 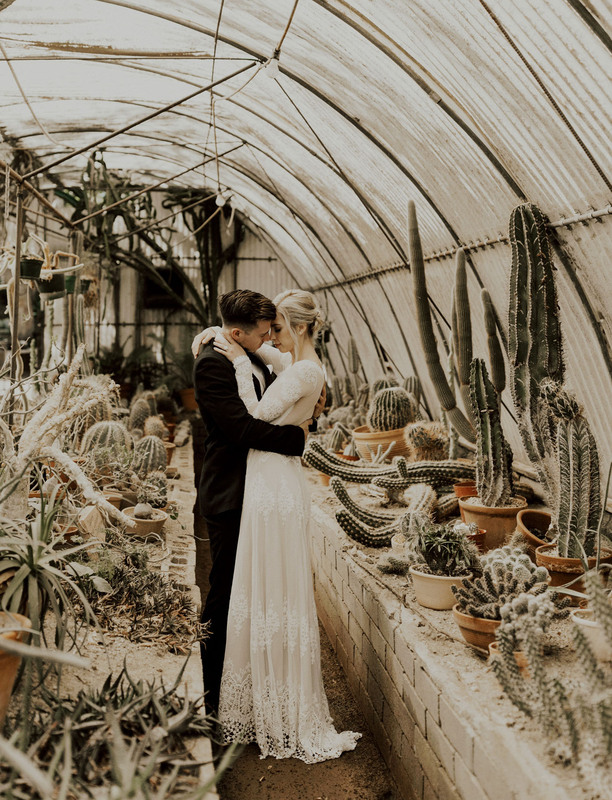 Weddings are about the two people in LOVE and those two people only. 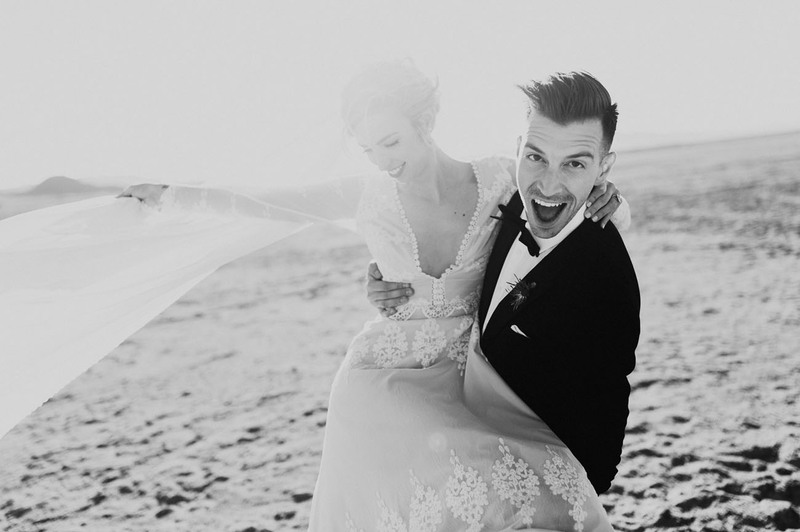 Don't let the stress and opinions of everyone sway how you want your wedding to be. 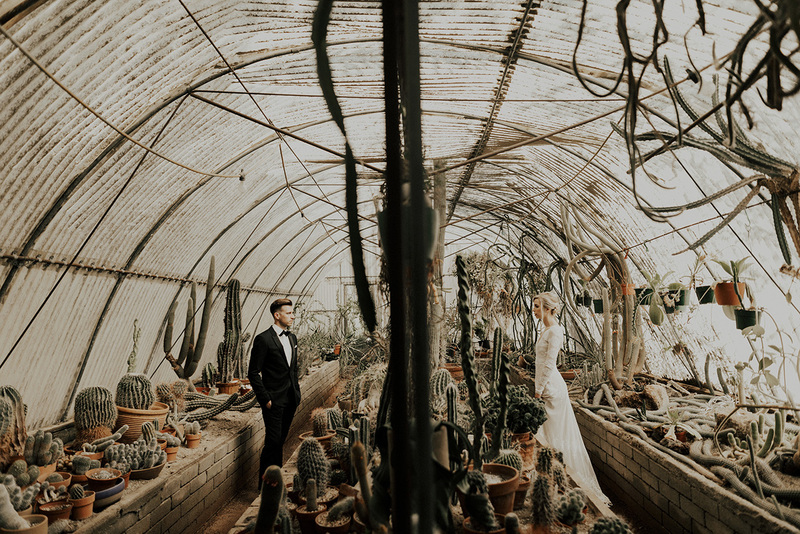 For us, we wanted something unique & untraditional. We stayed true to us through the whole journey and we couldn't be more happy about it. The COOLEST. Congrats, you two!! 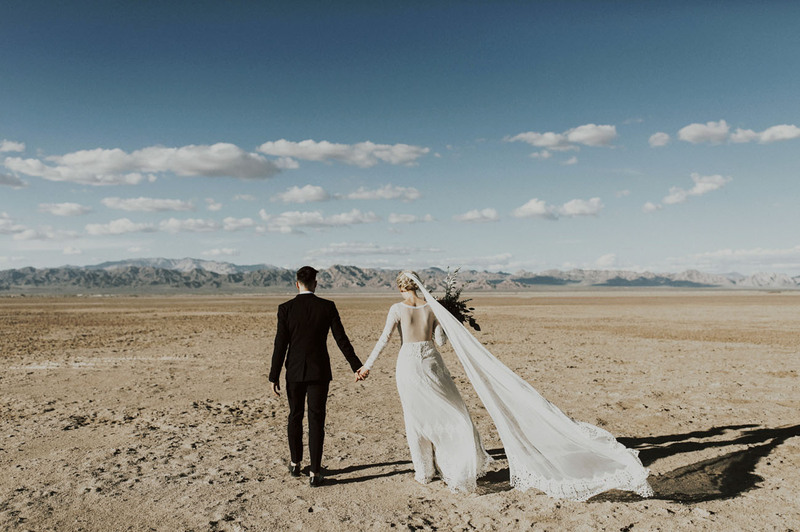 So, if you were to plan a pop-up wedding — where would you go? What would you do? To add to the amazing day, here’s a super rad video by Max Cutrone! Everything about this post is life!! Wow! 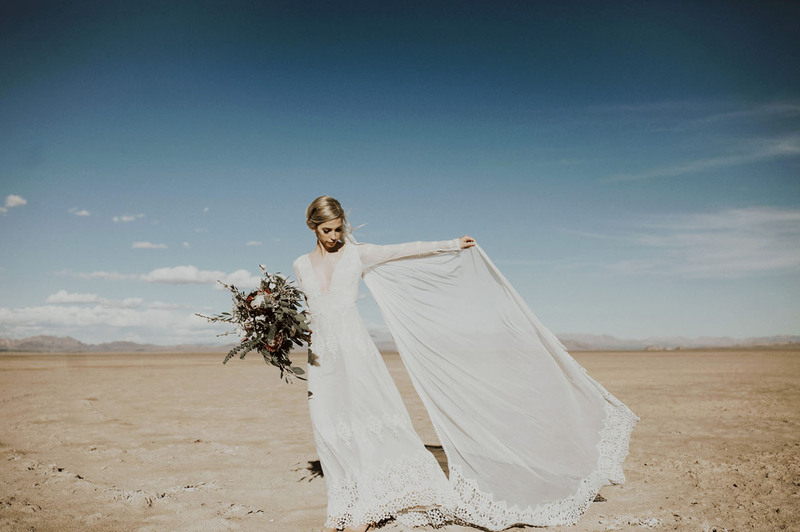 Seriously.. what a beautiful planned + curated day. 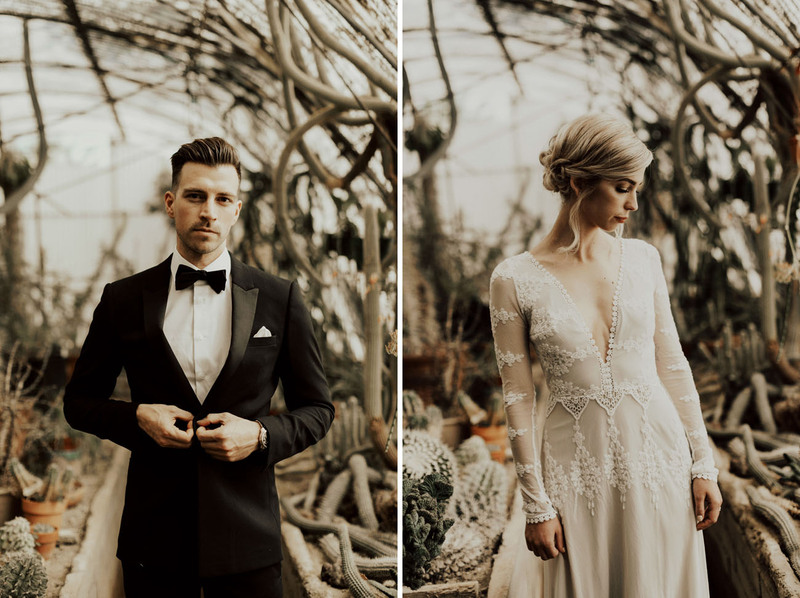 :-D And not to mention this couple is absolutely stunning! 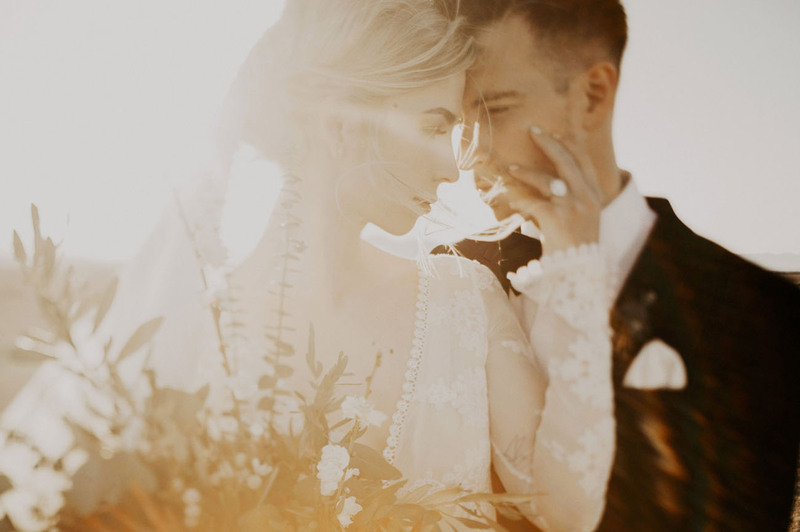 Usually I’m not one for such strong presets, but this photographer nailed it out of the park. 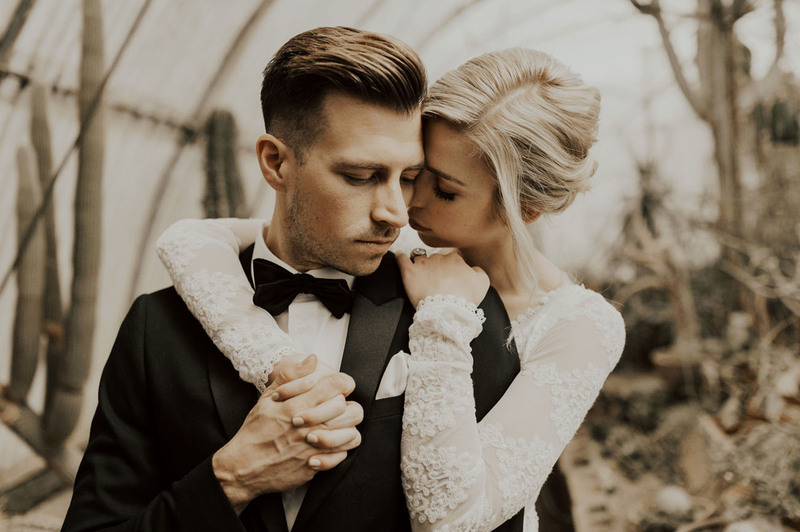 Thanks for always sharing such wonderful wedding content! 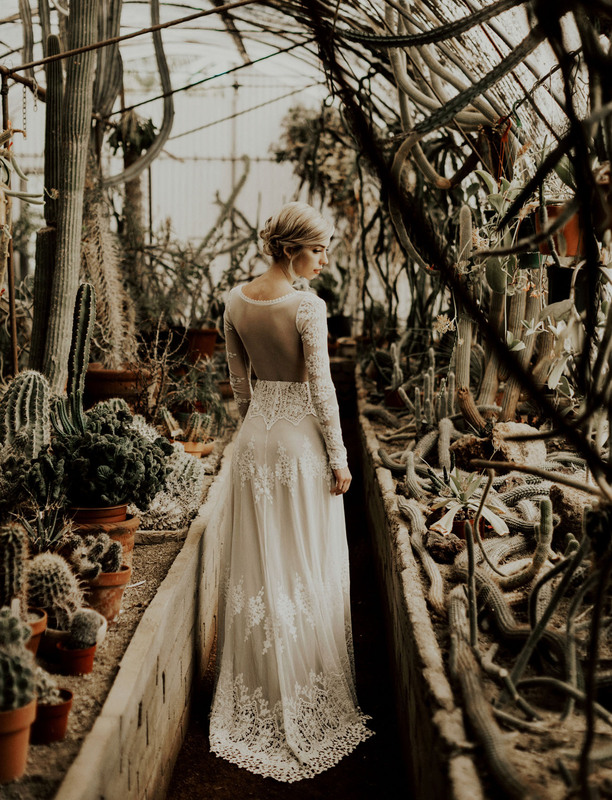 This is so gorgeous! 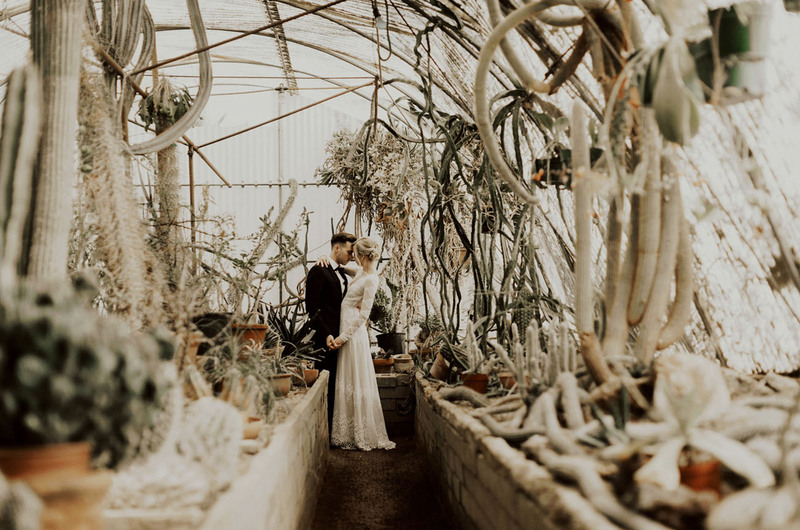 Love India Earl’s work, and I love how much personality the couple injected into their wedding! Wow, stunning photography! 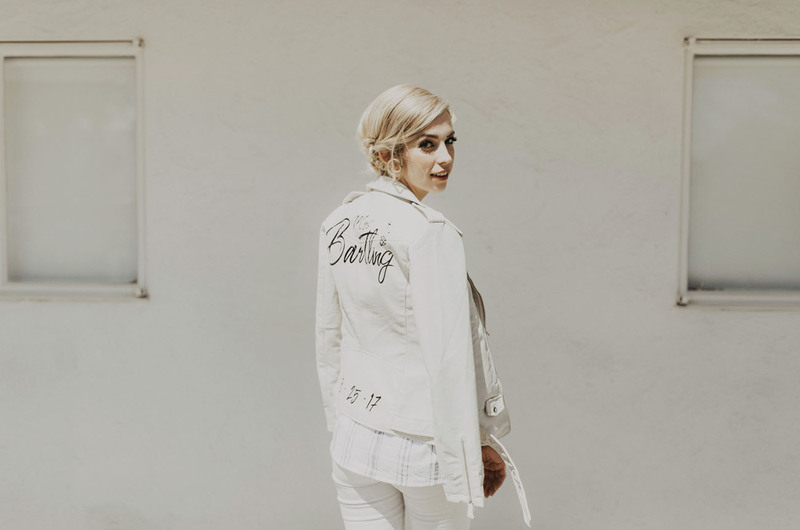 The leather jackets are great.